These ads were all ripped from a couple of my brother's old comic books I had lying around. G.I. Joe and a few others. Well, with that out of the way, here you go. Oh, by the way, these pages are very large, so be prepared to wait a while for it to load all the way. Also, some are hard to read, so I typed them up for you. Lots of them are even hard to read in the actual book! 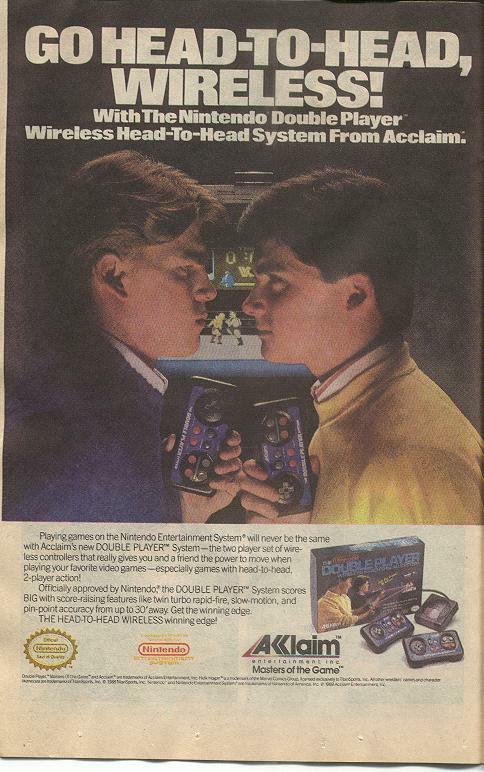 Playing games on the Nintendo Entertainment System™ will never be the same with Acclaim's new DOUBLE PLAYER™ System—the two player set of wireless controllers that really gives you and a friend the power to move when playing your favorite video games — especially games with head-to-head, 2-player action! Officially approved by Nintendo®, the DOUBLE PLAYER™ System scores BIG with score-raising features like twin turbo rapid-fire, slow-motion, and pin-point accuracy from up to 30' away. Get the winning edge. THE HEAD-TO-HEAD WIRELESS winning edge!